The M6 Gran Coupe is a sporty premium four-door coupe from German luxury automaker BMW. The M6 Gran Coupe is based on BMW’s upscale 6-Series line, but it’s loaded up with extra performance features that push the sticker price well over the six-figure mark. The M6 Gran Coupe competes with other performance coupes on the market, primarily those from other European manufacturers, based on performance and price, if not on styling. 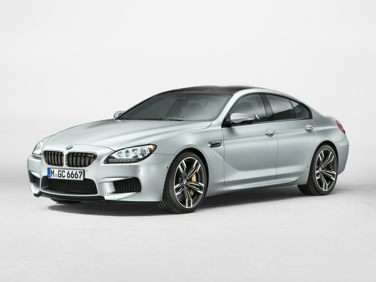 The M6 Gran Coupe looks upscale, like all BMWs, but it does not have the attitude of a true two-door premium coupe. It fills a void in the BMW family, however. The BMW M6 Gran Coupe is new for the 2014 model year to round out the top of the BMW model lineup, and went on sale in the United States in the summer of 2013. For some performance car enthusiasts, one of the most important assets of the BMW M6 Gran Coupe is its manual transmission option. Manual transmissions have been gradually phased out, even by auto manufacturers that market specifically to performance drivers, in favor of more technologically advanced automatic or semi-automatic gearboxes. In the case of the M6 Gran Coupe, though, the driver gets to play with a more traditional seven-speed double-clutch transmission, which connects to a 4.4-liter twin turbo V8 engine, a drivetrain that’s shared with the M5 and other models in the M6 range. The M6 Gran Coupe received a little extra treatment so its larger body can better handle the 560 horsepower and achieve its 3.7 second 0-60 time. The chassis (also shared with the M5 and M6), suspension, and brakes all got upgraded to elevate the car to a more performance-oriented level, and a set of 20-inch alloy wheels holds down all four corners. Though the M6 Gran Coupe incorporates the familiar design cues of the BMW lineup, the four-door coupe layout is really best when it’s used only for the occasional backseat passengers, since interior space is tight. Though the space for a third backseat passenger is, technically, there, an occupant in that spot must sit atop the rear center console. The front seat space, including the driver’s seat, is compromised to accommodate the capacity for extra passengers, as well as to enable the low sloping roofline that gives the car its distinctive profile. However, the M6 Gran Coupe made the cabin comfortable in other ways. The front seats are heated, and the driver gets a ton of high tech accessories such as auto dimming mirrors, premium audio system, parking assistance, lane change and lane departure assistance, rear view and surrounding monitors, and a night vision system. Options such as a heated steering wheel, heated rear seats, and an even more premium Bang & Olufsen surround sound audio system ensure the M6 Gran Coupe holds its spot in the luxury performance coupe market.